I’ve had a pretty full weekend. It started out on Friday night with my daughter’s ballet recital. She looked beautiful in her costume and radiated excitement. Of course, this necessitated a later night out than usual for me, so I just planned on dealing with less sleep than I am accustomed. I think I got to bed around 10:30 pm. It took an Ambien to knock me out and I only slumbered until 2am Saturday morning. I got up and ate a peanut butter and jelly sandwich and then lay in bed for the next 1.5 hours. 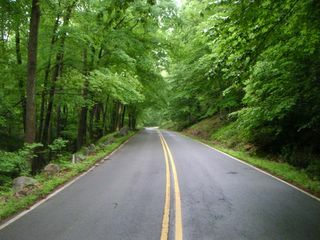 I gave up trying to sleep sometime before 4am, so I started to get myself ready for my ride in Harriman State Park (HSP). I picked up Lowell, my riding partner for the day just after 5am and we started to ride just after 6:30am. The day started out rainy and overcast, but you could see the sky trying to clear as we headed further north. By the time we started to ride, the rain had stopped, but we encountered wet roads and some fog through the climbs. As the day wore on, the sun broke through and we had a spectacularly beautiful day to ride. On our first loop, I snapped a couple of photos while we were climbing the road Tiorati Circle. 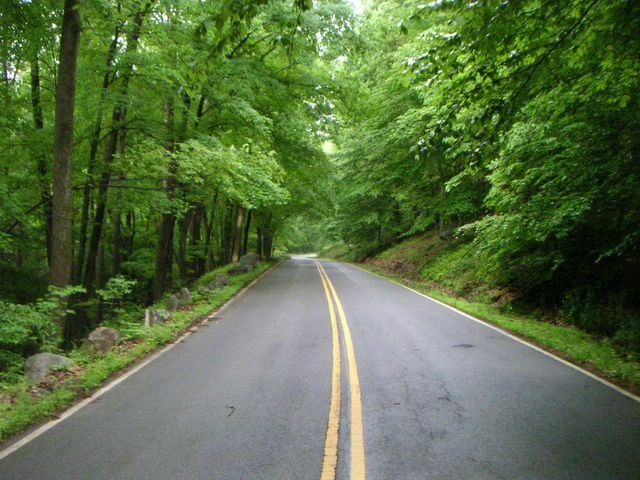 This is a much forested road, with streams, waterfalls and lakes. It was peaceful and serene, with only the sounds of our breathing or my exclamations at the beauty of it all punctuating the sounds of the mountains. 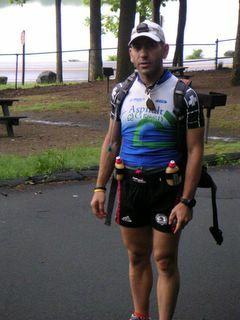 Upon completion of the first loop, we ran into our fellow Tri Club member Jason. He was joining us in the mountains to train for the Canada Death March – an ultramarathon with an elevation ascent equivalent to Mt. Everest. Jason was hitching a ride with us back to the city after his run, since his ride up did not plan to stay for that long. One and a half loops later, we encountered Jason again on his first loop around Harriman. We didn’t see him again, as after his first loop; he abandoned the roads in favor of running the trails. At some point during our third loop, I lost one of my fueling bottles. This contains 700 calories and was half of what I was hoping to consume during the day. The bottle was in one of the bottle cages behind my saddle, which are prone to being launched if the cage doesn’t grip it snuggly and you hit a solid bump in the road. Fortunately, I also had some Hammer Gel with me and it managed to get me through the ride. I am sure the loss of one of my main fueling sources contributed to the fatigue I felt during our 6th and final lap. Our lap times for the 5th and 6th lap were now taking over 50 minutes and I feared that one more loop would take well over 60 minutes. Rather than try to gut out another 15 miles, we decided to stop riding and go for our 5 mile run. Our decision must have been providence, since at this time we saw Jason start making his way down a trail back towards our cars. At this point Jason had only run 23 miles. I told him I was disappointed as I expected him to have run at least 28-36 miles by now. While we racked our bike, Jason switched out of his trail sneakers into his road running shoes so he could run 5 more miles with us. Lowell and I were both happy to be off the bikes. When I started to run, it felt like I put on a new set of legs. I felt great and happily ran our out and back course. After all of us finished running, we headed to the lake. Jason and I took a couple of short swims, while Lowell declined to fully immerse his whole body in the water because it was too chilly. Later in the day, after I returned home, my kids and I washed our car. It was a nice way to spend the remainder of a hot afternoon. Both my children seemed to love the idea of climbing on top of our Ford Explorer and cleaning the roof. After we ate dinner and then went for a bike ride into Prospect Park. We rode around the park one time and into Long Meadow field to watch the planned fireworks and the first Star Wars movie. I didn’t get to bed until well after midnight, giving me almost 24 hours of constant activity. The next morning, Sunday, I got up around 8am to do a 10 mile run. I discovered a race being held in Prospect Park, which included Pee Wee Races. I thought my kids would enjoy doing this race, so I ran back home to see if they wanted to do it. The answer from my son was an emphatic yes, and my daughter reluctantly decided to try it as well. I shuttled myself back and forth to race registration and planned to meet my wife back in the park by 11am. The kids ran the races and had a blast. I capped my weekend off, by taking my daughter to a birthday party and then having an archeological expedition in my back yard. My son wanted to dig a hole and as we started digging deeper, we began to find buried bricks, tiles, a marble and the cap from an old German cold remedy called Formamint. Maybe I can sell it on eBay and buy an energy bar with the proceeds.